This is a real show stopper Fruit Gift Basket that is a terrific choice for many of the gift giving reasons. A healthy choice that can be sent to your family and friends or co-workers for a variety of reasons. The versatility of this gift basket is unlimited, and can be decorated up for any gift giving occasion, such as a Sympathy Gift Basket, a Corporate Gift Basket or a Thank You Gift Basket. 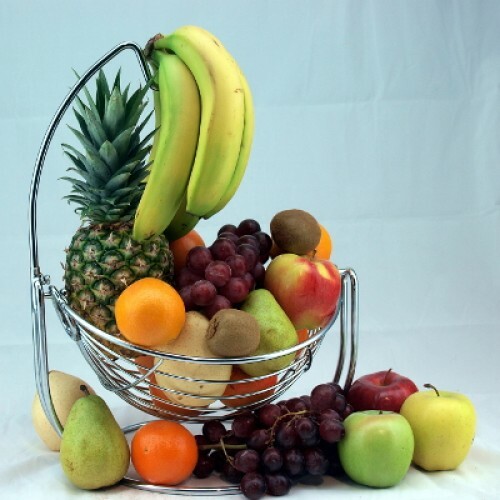 Fruits that are chosen, are in season, local when possible, and of varying ripenesses so that the basket can be enjoyed for a lengthy period of time. This Fruit Gift Basket is a favorite for healthy choices, and items such as nuts, cheese, and wine can be added at your request.